"Hey, baby, do you want to see the halter?" She took her time to smell it and then to chew on it for a little bit. Then it was put away. This was the first introduction to the halter. 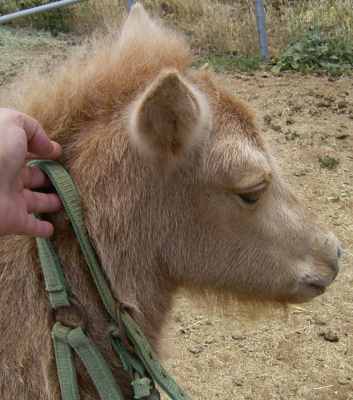 The point was not to put the halter on, but to expose the filly to the halter, it's smell, it's taste. This will be done several times so she accepts it as part of her surroundings before the next step, which will be to put the halter against different parts of her body, especially near her ears (and from above). She'll see it and feel it from different positions before being asked to be haltered. The next lesson starts with a review of the above, and then to start the filly with accepting the halter touching different parts of her body. 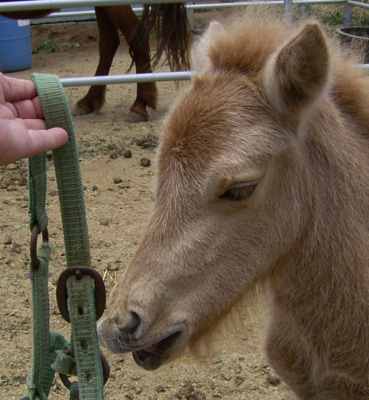 We want the foal to "love" this halter, and to "know" it before we ever ask her to wear it. 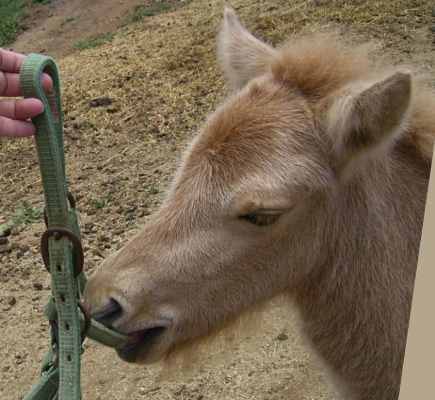 Sometimes it may be helpful to rub a new halter all over the mare, so that the foal recognizes her scent on the halter. Perhaps it doesn't seem so odd or different if it smells like mom :-). A little dab of lavender might also be helpful for some horses. Roka had her second leading lesson Monday and did very well. Prior to leading, I'd rubbed the halter on her to scratch her itches, slipped it on and quickly off her nose, laid the strap that goes to the buckle, behind her ears and then as she started nibbling mare/foal pellets, asking her to reach through the halter for them. 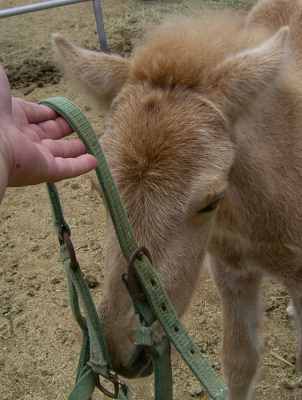 Some days she really didn't want to have much to do with the halter, so I'd just rub her a few times and leave. On other days, especially when she was sleepy, I'd slip the halter off and on several times. I had also used the clicker and reinforced with scratches or treats. Her first leading lesson consisted of me haltering her and asking her to step forward at a slight angle (to avoid bracing against the pressure). I only did that a few times to the right and left and then just walked her mom off and she followed so she could get used to feeling the halter on and lead dangling. This time I gave mom something to eat but kept her nearby. 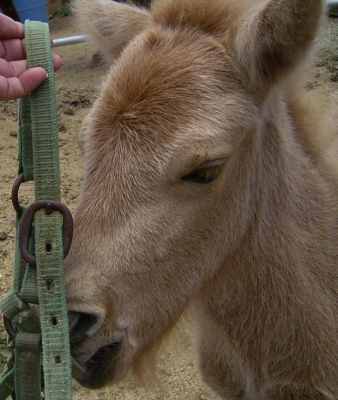 Roka put her nose in the halter and got clicked and foal pellets. I backed it off her before she did, but the second time she stood very relaxed so I buckled the halter. She had no problem with me clipping the lead on (I've had other foals jump or run just form hearing that sound). Then I asked Roka to give to slight lead rope pressure, again, slightly off center from forward first left then right so we did a slightly staggered forward walk. Each time she stepped toward the light pressure, I released pressure and at the same time clicked. She remembered the clicker from the few prior lessons and immediately stopped and waited for her treat. I also asked her to back one step, a few times. Then I got her mom and we went for a walk. When she tried to walk beyond the scope of the lead, I just kept it taut and she came right back to a loose rope. We walked a bit and grazed a lot. During some of the grazing I draped the rope over her back, let it flop against her legs, and later, draped it over her head. Not even a flinch!